It's a blustery October-like day here in Minnesota, (despite being July 26th!) so it's a perfect day to cozy up and enjoy some fantastic ideas from colleagues. First up we have Mrs. S at Thrive after Three showcasing her *amazing* system for organizing all her flannels, puppets, and props. From "The Old Woman Who Lived in a Shoe" to a variety of stylin' kicks, Kathryn at Fun with Friends at Storytime shares lots of inspiration for a shoe-themed storytime. Jane at Piper Loves the Library celebrates Shark Week with a fierce shark flannel, and also inspires with the clever idea to give kids a color photocopy of the flannel pieces. Kids can take the sheet home, cut out the pieces, and play storytime at home! What is Bridget Reading? Lunch! by Denise Fleming. An excellent example of making the most out of those gorgeous flannel pieces we work so hard on--re purposing for multiple stories! Jane (and Piper!) just couldn't stay away from Flannel Friday, and came back with another post. This time showcasing some older pieces and sharing a technique to make flannel board time interactive in a whole new way. Brooke at Reading with Red shares a sweet way to introduce a theme into baby storytime, and backs it with with her early literacy mojo. Lisa in Libraryland (I just love saying that) has some adorable (sturdy) foam sheep, and has really done her research to find dynamic ways to share the familiar tune of "Mary Had a Little Lamb"
Over at Artistic Literacy, Amber inspires us with some awesome flowers that have multiple uses, from counting, to color identification, to matching and patterning. Awesome! Andrea at Librarian vs. Storytime has a flannelization of the new-to-me book "I Heard a Little Baa." Andrea wins the, "Most likely to make Anna run out and copy her" award this week! How have I missed this perfect little storytime rhyme?! This week, I shared a technique for doing a 'letter of the day' in storytime without using puppets. For some reason lots of the people who do a regular "Letter of the day" use puppets (including me). But if you want to read my ideas for a puppet-free letter of the day, check it out here. Thanks for reading and contributing, you are what makes Flannel Friday wonderful! 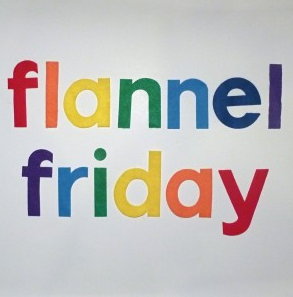 To learn more about Flannel Friday, check out the Flannel Friday Blog.